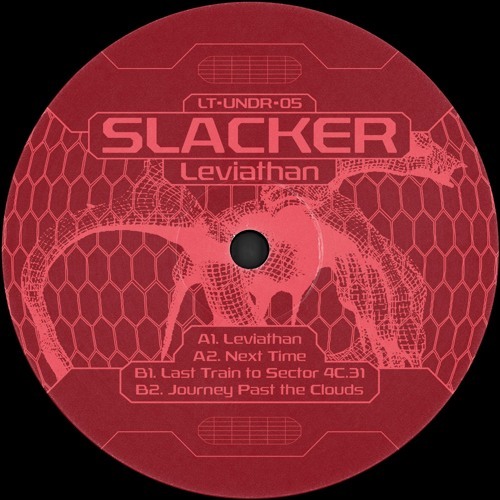 Slacker returns to the Lobster fort this time with a sublime four-tracker combining a mixture of melodic electro, addictive breaks and nods of dub-techno on the LT-UNDR series. ‘Leviathan’ kicks off the EP with abyssal acid lines leading into swelling melodies and heightened tension. ‘Next Time’ takes us on a rhythmic journey, galloping through dusty breaks and sparkling synth lines on a space voyage of hinting dub techno. On the flip side, ‘Last Train To Sector 4C.31’ sends us into a dream state. Melancholic strings and distant sirens are followed by a lost voice of longing which then combines with crunchy pads to create an ethereal sense of reverie. Ushered by a croaking distortion buffered with calming tranquil chimes, ‘Journey Past The Clouds’ massages intricate drums and peaceful nostalgia leaving a feeling of amplified harmony.